The team gets stranded at the Battle of the Alamo. Are they setting us up for a reveal of Flynn somehow being Lucy's father? (Or, since he has that journal of hers that she hasn't yet written, is he her descendant?) Not sure how either one can be possible if the Hindenburg trip was the first time travel for both characters, but, the mystery Dad can't be just some random dude unconnected to the main arc. I'm expecting pretty much the same as you with regards to Flynn. He's a part of her life somehow. I kept expecting him to be the father, but now I'm thinking he's somebody else and the father will be somebody she ends up tripping across in the past. I like the fact they're moving Lucy's plot along: that she and her mother aren't going to fight about the father's identity for the next six episodes. I'm tired of shows that drag things out past the point where I'm interested in finding out the details. I do want to find out more about Wyatt's personal life and recent past, although I guess I can't complain too much because they did give us the PTSD stuff. I've been thinking for the past episode or two that Flynn is Lucy's father, but I especially thought they telegraphed it in this episode when Flynn asked General Santa Anna "Are you a father?" while begging for the release of the women and children (which would of course include Lucy). 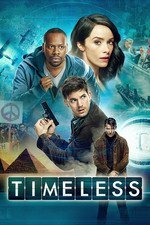 Wait, okay, I've missed a couple episodes but has this show explained why they can't time travel to a couple days before whenever Flynn goes, after he goes? They have a time machine. Exactly and they need to rush to leave as soon as the bad time machine leaves the present. Generally shouldn't examine time travel shows logic too closely. I figured maybe there was something-something about theirs being the less sophisticated time machine and that something-something reason something. If Flynn were Lucy's father, he'd have to be from a different timeline, right, since he's not old enough in the one we we're seeing right now. So he could have created Lucy into a revised Earth by going back, working as a professor, meeting Lucy's mother, and setting Lucy on the trajectory of chasing him around time? I'm not sure for what purpose, although it helps explain why he's been close enough to harm Lucy and never has. There also has to be some sort of connection to the trapped-in-a-sinking-car/saved-by-a-stranger story Lucy told last week. She was going to run off and join a band but the experience set her on her course of learning history. Maybe that was Flynn nudging her back on course. Can Lucy be Flynn's mother? He has a diary presumingly written by her, when she is older and has a change of heart about the time traveling business. OlderLucy has stayed in the past and mothered Flynn, with precise instructions on how to change the timeline, because whatever happens to YoungLucy and gang has already happened. A bit convoluted but not implosable. Maybe there's a limited time to get out of your current timeline before whatever changes they're going to make overcome you (like a wave propagating forward through the timeline at some fixed speed into the future). It's clear that people left in the present don't know when the timeline has changed as that's just their new reality, but that doesn't seem to be the case for the crew going back in time, so there must be some small window where they're able to remove themselves before the changes overcome their current reality. Don't know why they can't get there a little before the other crew, but anytime they are in the past, they risk changing something, so maybe they're trying to limit the window of time in the past as much as possible to reduce the risk of changing something that turns out to be significant. Or, and I think this is a better pseudoscientific answer if they're looking for one, maybe the fact of your presence in the past changes the timeline (like collapsing a probability wave by viewing it) so that if you don't enter the timeline at the exact same time as the other crew, you can't enter it with them at all and the other time machine would get deflected to some other point on the timeline meaning you can't track/stop them before whatever they're going to do gets fixed in time. I said 2/3rds on the way in that I would have so much respect for this show had they let soldier mcsoldier die at the Alamo and just had a new soldier take his place. It works have been amazing. Can you imagine a network TV show doing that?